Story goals that find characters breaking free of being stuck within their own mind. When an Author considers what it is the Protagonist in their story wants they often conjure up a new country the characters can call their own, a treasure chest full of rare emeralds, or the hand of a beautiful girl. Whether it be better living conditions or fantastic riches, the focus almost always remains on the external world. Where else, after all, would you find something worthy of so much attention, something valuable enough to be labeled the Story Goal? Unfortunately, this assumption that all efforts tend towards what is out there blinds many an Author to another, sometimes more sophisticated purpose. Think of the kinds of problems one finds when Overcoming Difficult Situations. Surviving a Nazi concentration camp. Breaking free from small town life. Unjust lifelong imprisonment. Each one of these features characters hopelessly stuck. Now imagine moving that fixed inequity inside the human mind and at once we witness a whole new realm of storytelling. Prejudice. Hysteria. An inability to forget. Problems bred of the same fixed nature as an external situation, yet found deep within the human mind. Resolution here comes not in the form of crossing a finish line or proving innocence but rather in the form of a changed mindset. Popular within many a play, these stories pit opinions and ideologies against one another, the solution falling into the ability to unstuck deep-rooted attitudes. In Stephen King’s novella Apt Pupil (NOT the film), an evil man has been forgotten. This potential explodes into conflict the moment a young teenage boy endeavors to blackmail the aging Nazi. Reviving this evil—the drive of the Protagonist in this twisted story—requires both remembering who this old man is and what he does. By forcing a recount of despicable deeds, the boy succeeds in securing his own place in history, ending it all with his own play for the memories of those families devastated by evil. On a much lighter note, the same Story Goal of remembering can be found in Mel Brooks’ 1976 classic Young Frankenstein. Trouble begins when Dr. Frederick Frankenstein (pronounced “Fronk-en-steen”) learns that he has inherited his family’s estate in Transylvania. Although embarrassed by his familial association with the mad scientist Frankenstein, the young doctor finds himself intrigued by his ancestor’s work and begins slowly reviving the memory of the monster maker. The townspeople, rigid in their opinion towards scientists both mad and potentially mad, grow increasingly worried about the continued research. Only by properly pronouncing his family name—and thereby reclaiming his heritage—does the doctor finally find a way to resolve the issues in the story. Misplaced opinions and trouble-some preconceptions. Regardless of the problematic attitude, these stories both find resolution in the acquirement (or achievement) of a memory. In Bruges pits hit man against hit man with the unspoken code of their profession: “Kill a kid, pay a price”. Beginning with one professional breaking that very same code, the story brings the characters into conflict over the lack of hesitation—a conflict that eventually brings them all to ruin. Unlike previous stories featured in this series on Story Goals, In Bruges provides the first example of what happens when characters can’t find resolution. The drive to achieve the Story Goal does not always end in success. The presupposition of a happy ending runs counter to the reality of Meaningful Endings. Sometimes the solution arrives, other times it lies dormant. The professional killers of In Bruges fail to overcome their fixed attitudes, they fail to control their impulses. Here the problem of the story overwhelms any potential solution leaving the inequity intact well beyond the curtain drop. Contrast this failure with the successful resolution found in the “Self-Esteem” episode of the television series My So Called Life. Exploring the prejudice present within hallowed high school hallways, this story grants relief to teenage crush with an act of naked exposure. In front of all, and in complete disregard of established caste systems, cool boy asks wallflower girl to date and the girl accepts—without hesitation—“Sure.” Supplanting the urge to run and hide brings peace, and happiness, and above all else—love. Love also seems to be on the minds of everyone in When Harry Met Sally. Starting with their decision to share a ride to New York, both Harry and Sally and everyone around them clash over their different attitudes towards finding a partner for life. Love—romantic love—takes the Story Goal position here and waits patiently for one or the other to choose their heart over their head. Changing one’s opinion towards love eventually resolves the problems in the story. The same relationship between inequity and Goal awaits in George Cukor’s classic The Philadelphia Story. Problems begin when a wealthy socialite decides to marry nouvea riche, bringing to light issues of prejudice, pretension and all-around haughty bad attitudes. Class warfare in the search of relief. Release comes with a gesture of love, a promise to marry and the introduction of true deep happiness. In both stories, the fulfillment of desire secures peace of mind for those brought into conflict over differing mindsets. But what of characters who know their differing mindsets to be the culprit, yet still refuse to entertain the alternative? 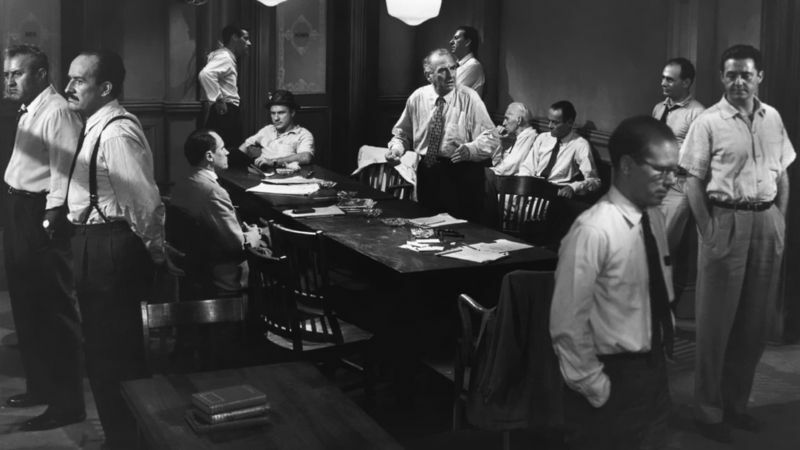 Check out Sydney Lumet’s 12 Angry Men for a great example of a conflict of contemplation. Bias tips the scales once one of twelve jurors decides to run counter to popular opinion, declaring the defendant not guilty. The deliberations, both quiet and impassioned, that develop over the course of the story beg for the remaining unconvinced to simply contemplate the idea of innocence. The moment consideration supplants prejudice, solution trumps problem and balance returns. Note how many of these examples come from plays or are movies based on plays. The mind story finds greater mobility in a medium that more readily portrays the thoughts and attitudes of characters in conflict. The literary gateway present in novels and plays provides fertile ground for this type of dramatic exploration, yet shouldn’t be seen as an excuse to discount its potential on the silver screen. Ambitious Authors may recognize an opportunity to present a unique and challenging experience by externalizing the problems of the mind. Regardless of the type of internal conflict—a refusal to remember, a compulsion to act first and think later, an unfulfilled desire or a conscious decision to think for one’s self—the solution always rests in ousting a fixed attitude. Free the mind from bias and equity will return. Leave it stuck and the desired resolution will remain a lost Goal. But what of the internal struggle to simply formulate an attitude? On the path to opinion lies the process of thinking, the process of developing ideas and the process of providing the fertile ground from which they can grow. Like the problems of external activities found in the article Achieving Story Goals that are Not Achievements, the problems of internal activities create their own unique issues, thus requiring completely different Story Goals as of yet not discussed in this series. The following article covers these stories of distended psychologies and provides Authors an opportunity to manage the world of malfeasance manipulation. The Dramatica Theory of Story classifies these stories of incompatible attitudes under the Mind (or Fixed Attitude) Domain. Cradling together concerns of Memories, Impulsive Responses, Innermost Desires and Contemplation, this corner of the structural model covers the entirety of stories built upon inequitable opinion.